– Retired and currently serving as a hotel in Long Beach, California. The Cunard-White Star liner Queen Mary was a legend right from the start. 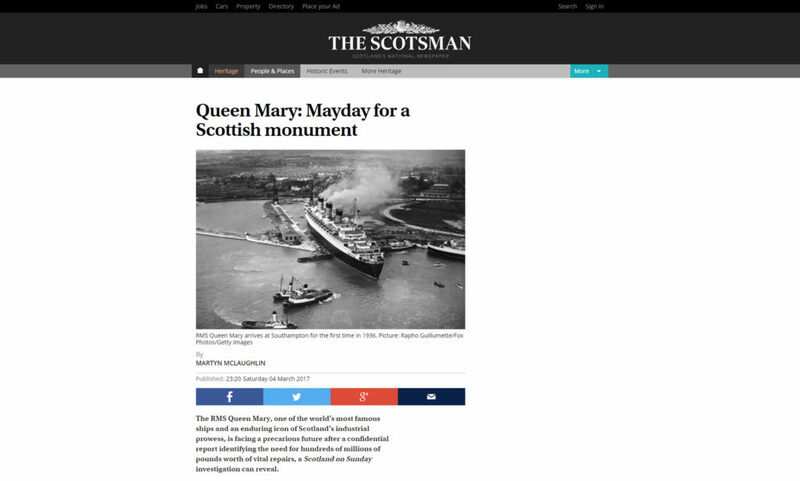 When she was laid out at the John Brown shipyards on the River Clyde, it was already clear that she would be something special, and she was the pride of the British maritime community. This was true even though she, at that point, did not even have a name. She was simply referred to by her shipyard designation of “Hull No. 534”. Due to the Depression, however, Cunard ran out of money to finish her construction. At this stage, the White Star Line was also building a 1,000-foot, 30-knot vessel at Harland & Wolff’s Belfast shipyards, which was to be named Oceanic (III). Suffering from shockingly poor management during the twenties, White Star was already in a financial bind before the Depression hit; it quickly became clear that they, like Cunard, would be unable to complete their ship without financial aid. Cunard approached the British Government; they had successfully attained loans and subsidies from Parliament in 1902 to build the Lusitania and Mauretania, and the collaboration had worked very well. Parliament agreed to subsidize construction only if Cunard and White Star merged. It was clear to them that in those lean times, two giant British rivals would not be able to survive independently. Cunard and White Star entered into negotiations. The final deal put White Star as the significantly junior member, and the name of the new company hence became Cunard-White Star. Later, the “-White Star” suffix was dropped and the company reverted to its old name, “Cunard”. This merger saw the end of the Titanic‘s old legacy; her sister Olympic was soon scrapped, and most of the other White Star ships went the same way in short order. 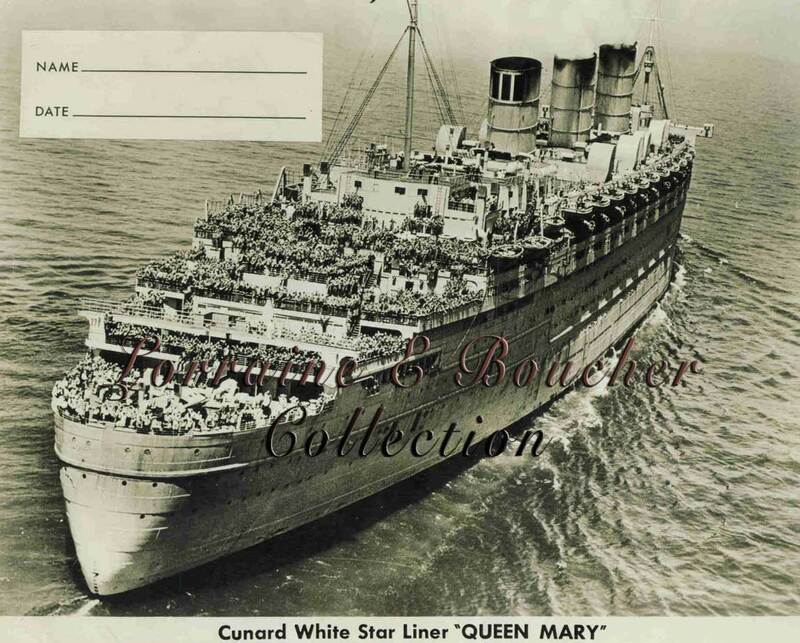 The Majestic, White Star’s old flagship – the former German liner Bismarck – went before Cunard’s Berengaria. But old Cunarders, too, went fast. The Mauretania went even before the Olympic, and the Berengaria – by that time a tinderbox that was regularly catching fire – went not long after. When she first entered service, the Queen Mary was facing some stiff new competition. The Germans and Italians had built a succession of super-fast and ultra-modern liners during the late 1920’s, whose ranks included the Bremen and Europa, the Rex and the Conte de Savoia. The French Line was also building a colossal new ship: the Normandie, which made it into service first and was – albeit debatably – the larger of the two vessels. 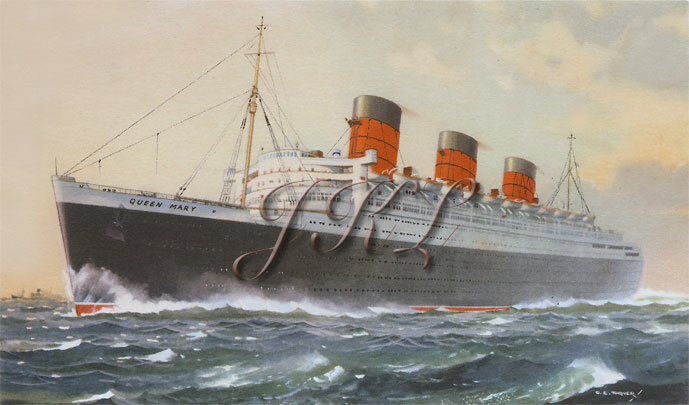 The Queen Mary‘s maiden voyage came in the spring of 1936. The political climate was growing ever more tense in Europe. In Germany, the Fascist Nazi party was flexing its newfound muscle, moving forward in its quixotic desire for territorial expansion and in its disgusting ideals of creating an Aryan master race by exterminating ‘weaker’ races. By the time the Mary had been in service for only three and a half years, Hitler had pushed too far. World War II broke out on September 1, 1939 as Germany invaded Poland. The beautiful Queen Mary, fastest ship in the world, now found herself in the middle of the most dangerous circumstances that would ever confront her; her Government service for the Allies over the next six years, when combined with the efforts of her younger, larger sister Queen Elizabeth, would quite literally change the outcome of the worst war that the world had ever seen. After the war, the Queen Mary was returned to civilian service with the Cunard Line, making her first post-war crossing in August of 1947. Paired up once more with her sister Queen Elizabeth, the two sisters pressed forward into a new era almost as if the war was no more than a terrible nightmare. In 1958, the Mary had special stabilizers installed to aid her notorious stability problems. Cunard continued to modernize and upgrade the ship in order to keep her competitive with commercial jet aircraft. Their advertisements tried to sell the idea that ‘getting there was half the fun,’ and that it was something to be savored rather than sped through as aboard a jet. However, the handwriting was certainly on the wall for both sisters. Eventually, revenues continued to decline to the point where the Mary and the Elizabeth were simply no longer viable. 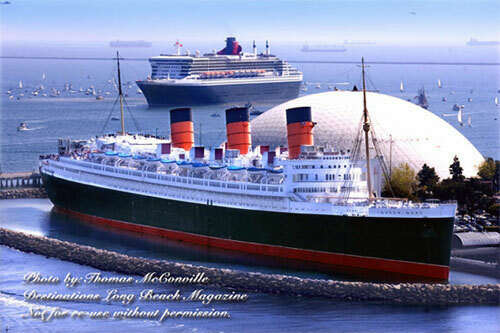 In 1967, the Queen Mary was sold to the city of Long Beach, California. She became, and remains now, a hotel and tourist attraction. She frequently serves as a shooting location for various films and documentaries depicting other liners, such as the legendary Titanic. Films such as The Poseidon Adventure and S.O.S. Titanic are included among these. On Thursday, February 23, 2006, two Cunard legends met for the first time. The new Queen Mary 2 sailed into the port of Long Beach and greeted her historic namesake, the original Queen Mary. The two ships saluted each other with their one-ton signaling horns. ~ Destinations Long Beach Magazine. In recent years, concern has been expressed over the level of care, upkeep, and maintenance which the Queen Mary has received. Faced with another round of economic ‘lean times’ in the wake of the 2008 world financial crisis, the ship was taken over by new owners. Hopes ran high that her owners, working in conjunction with the City of Long Beach, could maintain the ship and continue to make her an enjoyable, historically sensitive, and financially viable tourist attraction. Appointed as Relief Captain to Captain Jones. Captain John Treasure Jones In command for final round trip voyage, 9/16/1967 – 9/27/67, and for the final voyage ’round the horn to Long Beach, CA, 10/31/1967 – 12/9/1967. Captain Jones Officially handed the Queen Mary over to Long Beach on 12/11/1967, and her registry was cancelled. Updates to this page’s content are in progress – please be patient. For corrections, please contact me. Please also remember: if you have photographic or technical data, or personal accounts of crossings on any of these ships or on the other liners contained on this site, and would like to see these items included on this site or in the upcoming volume, please use the contact page of this site to let me know.